This is most categorically not a sheer foundation. Depending on application method, you're going to get anything from a very-opaque-on-the-high-end-of-medium to a full coverage out of it. It gives a genuinely flawless finish, and because of the high percentage of pigments contained therein (40% of the formulation is pigments, which is a very high proportion), one layer of this is more than sufficient. This is very opaque and although it supposedly provides a natural high coverage, I've found that it's quite a bit more of a matte finish than a natural one. 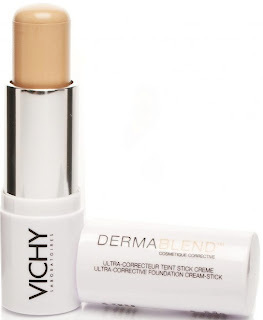 It's not a dead matte, but it's not far off - an illuminator or illuminising primer underneath works wonders for bringing your skin to life under this foundation. I quite like how this feels - it's reasonably lightweight and doesn't feel at all heavy or cloying like a lot of cream-stick type foundations can. It's quite long-lasting; I get a good twelve hours out of this (without powdering), which is the product's claim. 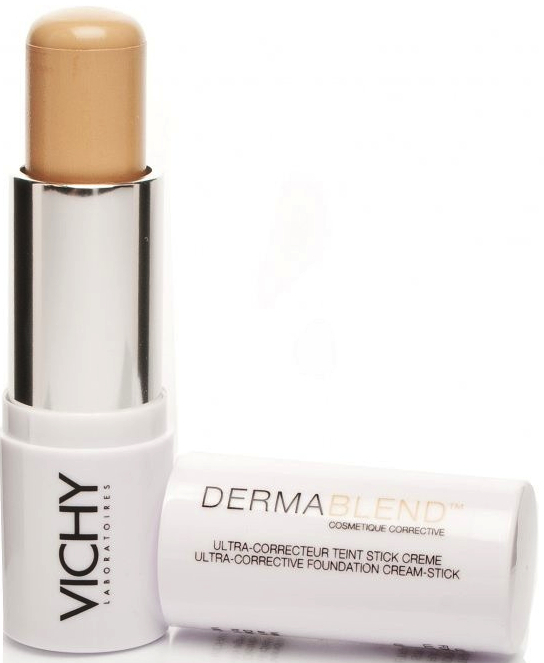 One layer of this works nicely as foundation, as a concealer you need to layer it a bit. It is scent-free, which is always great in my opinion. According to Vichy, it's formulated for women looking to camouflage moderate to severe skin imperfections (angiomas, vitiligo, scarring, acne etc). I have definitely found that it really does correct minor redness and blemishes, minor hyper-pigmentation and moderate dark circles, and gives the skin a lovely even appearance. But it needs a well-moisturised base and a primer most definitely helps with slip on application. Look here for more information on the Vichy site. 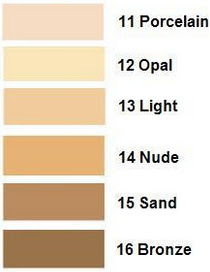 As you can see, there's a very limited number of colours available, and they tend to dry-down a little darker than they appear in the stick, but actually the range available works across the board for most skins that I've used them on. Because of the formulation, they are a bit more difficult to blend together to create custom colours, however not impossible. Vichy recommends that you apply with your hands, by warming between fingers before blending onto your face. Personally I like to apply it straight onto the face from the stick and blend it out with my fingers or a dense buffing brush (a wet or dry sponge or a flat brush can also do the trick but needs a little more work). As a concealer, any good dense concealer brush works well. I haven't personally found the need to powder on my skin (combination) but as with all foundations, oilier skins will definitely benefit from powdering. This is quite a smooth feeling foundation, which feels slightly powdery on application (it does contain talc, which probably accounts for this), however it doesn't drag unless your skin is particularly dry. As mentioned earlier, pigments account for 40% of the formulation, which means that you don't need to use a huge amount of it. It's waterproof and long-lasting. It contains mineral oil and talc and is paraben-free. This purports to be good for all skin types: I don't particularly agree with this as I've found that it can dry out skin, so it's better for normal-to-oilier skin. On dry skin, it can look patchy, so I don't recommend it in this instance. Priced in the ball-park of €21 from most pharmacies, you get 12g and it has SPF30 protection. It flashes back, so I don't use it for flash photography. Because there are no parabens, it works well for sensitive skin, it is non-comedogenic and hypoallergenic and, providing you don't have dry skin, it should work well for you. It's not a particularly exciting foundation, but it is readily available, it shouldn't cause breakouts or sensitivity flare-ups, it's not hugely expensive, and it's very portable, it's a handy go-to one if you find yourself overnighting and have a foundation emergency! H&M Medium Lashes - shout out! Burgundy Part II: And on to The Makeup!